Engineered and mastered at Heathmans Studios. Thanks to everyone at Heathmans. Housed in six CD single jewel-cases inside a card box. Track 2-02 credits "Grimey" (the track name) for the musical credit by mistake. Track 4-04 has no mix name listed. Track 4-10 is the same as "Mastervibe – Lets Roll" on Pure Drum & Bass. Only realised today that its full of vinyl rips. Maybe the 'Ultimate' tag is a bit much but this is a good compilation. Nothing cutting edge but covers some recent classics back to some old skool classics. There are a lot of filler tracks but it is cheap. For any CDJ types its a great way to get some classics on CD in their unmixed and full length glory. 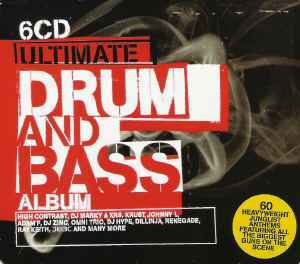 A fairly decent selection of tracks from the drum n bass back archives, however although the sticker on the front advertises that the album features 'all the biggest guns on the scene', there are some notable omissions - Dom & Roland, Origin Unknown, Goldie, Technical Itch and LTJ Bukem, to name a few. It cannot really be called an 'ultimate' album, then. However, if you're judging the quality based on the actual tracks themselves, there's definitely some good club-centric wobbly bass stuff like Dillinja and Adam F, and quite a few very good classic tunes from back in the day like Deep Blue's Helicopter Tune, Blame's Music Takes you, Renegade's Terrorist and Omni Trio's Renegade Snares. There's also a fair bit of the lighter side of the genre, like High Contrast, PFM and Hyper-On Experience, but as stated before no real representation of the darker side at all. Buy it if you want some unmixed versions of the tracks here, but don't expect an ultimate collection by any means. Would be a good purchase for someone who is not well-versed in drum n bass or not into the harder, darker side of the genre.